You've all seen "The Greatest Wedding Photo in the History of the World" (in which the bride and groom are running from a T-Rex). Well, Jeff Goldblum just one-upped that photo. Visual proof that no matter what the occasion, Photoshop finds a way. Wedding couple Jesse and Pamela Sargent had a very special guest attending their ceremony: Jeff Goldblum (aka Dr. Ian Malcolm). 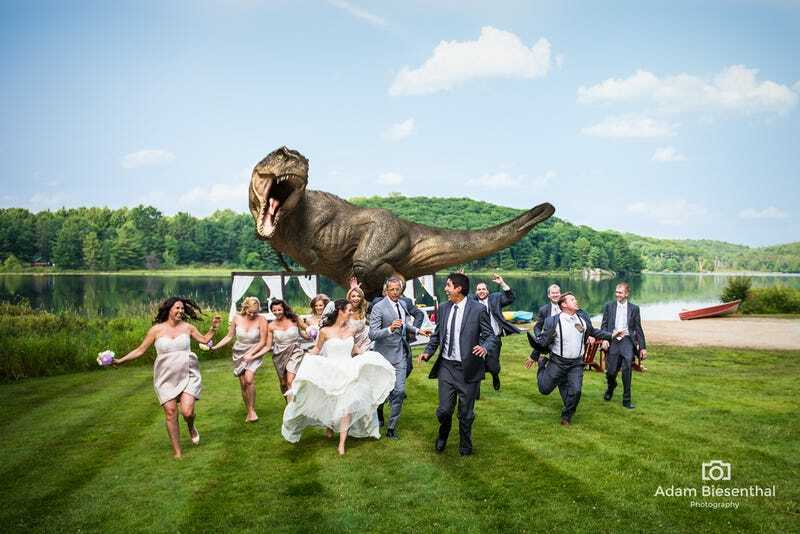 And when their photographer Adam Biesenthal, asked Goldblum if he would be game for the traditional "T-Rex chases the wedding party shot" the actor agreed. Let it be known that Jeff Goldblum remains, the best. Photograph from Adam Biesenthal's website.